bObsweep 726670294648 - Bobi features luxurious looks in a compact design. Bobi comes with the bObi blOck accessory, which lets you create an invisible wall across the floor. Her dustbin is fully washable, so you can clean out every last pet hair. Cheer up your pets with a robot vacuum that is specially made for fur-filled homes. When your dogs and cats are too tired to clean up after themselves, bObi springs to life with her TurboLift™ vacuum and back-to-back brushes. Silicone touch sensors and embedded wall sensor allow soft, bumper-less detection and navigation. Back-to-back rubber and bristle brushes scoop in extra dirt and scraps. Rinse bobi's fully washable dustbin for easy maintenance and a complete clean. 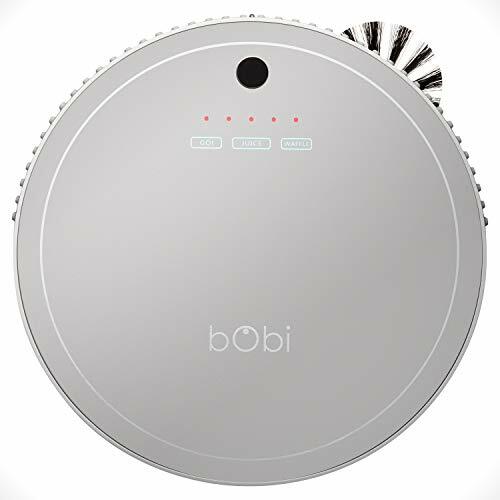 Bobi comes with a fullcommand remote to give you control of navigation and schedule automatic cleaning for up to 7 days. 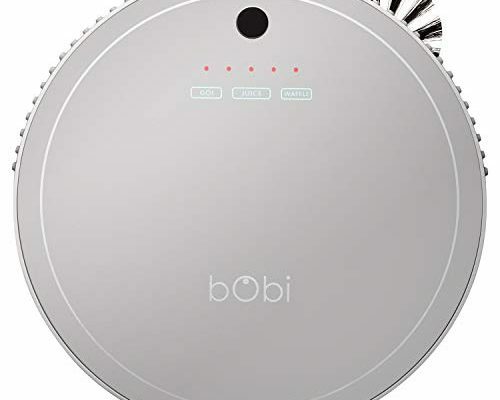 bObsweep bObi Pet Robotic Vacuum Cleaner, Silver - Bobi block creates an invisible wall so you can section off a space. Bobi is backed by a 2-year limited warranty, and an amazing, 5 years of subsidized service, US-based support team. Infinuvo HEPA Filter for Hovo 510 Series Robotic Vacuums. 3 pack, White. Infinuvo Hovo 510 HEPA Filter, White - Compatible models: hovo 510 by infinuvo, Bobi Classic by Bobsweep, Bobi Pet, Hoover Quest 1000. Not compatible models: Bobsweep Standard, Bobsweep Pethair. Infinuvo high efficiency HEPA filter works for Hovo 510 series and other compatible robotic vacuum cleaners. Before placing the order, make sure to check the bottom view photo of compatible vacuums on the left, so you get the correct filter. Infinuvo premium HEPA filter traps more dust and allergens than standard filter. When filter is clogged or damaged, the vacuum will loose suction and pick up less dust and debris from the floor. Works for hovo 510 series and other compatible robotic vacuums. Replace the filter every 3 months to keep your vacuum at peak performance! Infinuvo HEPA Filter for Hovo 510 Series Robotic Vacuums. 3 pack, White. - Infinuvo is not associated with BOBSWEEP INC. 3 infinuvo hepa filters per pack compatible robot vacuum models: hovo 510 by infinuvo hovo 510 plus by infinuvo bobi Classic by Bobsweep Bobi Pet by Bobsweep NOT compatible with: Bobsweep Standard Bobsweep Pethair * BOBSWEEP, bObi Pet, bObi Classic, Bob Standard and Bob PetHair are trademarks of bObsweep Inc. When filter is clogged or damaged, your vacuum will loose suction and pick up less dust and debris from the floor, so it is important to replace the filter every 3 months to keep the vacuum at peak performance. It traps more dust and allergens than standard filter. Infinuvo Replacement Battery for Hovo 510 Series and Compatible Robotic Vacuums. 14.4V, 2200mAH, NIMH Rechargeable Battery. Infinuvo Replacement DustBin for Hovo 510 Series and Compatible Robotic Vacuums - including Vacumm Motor and HEPA Filter. Infinuvo Hovo 510 Side Brush 3-pack - Including 3 replacement side brushes as a set. Infinuvo side brush for Hovo 510 and bObi robot vacuum models. You can buy other bobi spare parts, please search for "Parts Accessories Hovo 510 bObi Robot Vacuum. ". Infinuvo side brush works with Hovo 510 series and bObi compatible robot vacuum cleaners. If you need screw, please buy it from ASIN: B07JG1D19R. Works for hovo 510 series and other compatible robotic vacuums. Replace side brush regularly to keep your vacuum at peak performance. Compatible models: hovo 510 by infinuvo, Bobi Classic by Bobsweep, Bobi Pet, Hoover Quest 1000. Not compatible models: Bobsweep Standard, Bobsweep Pethair. Before placing the order, make sure to check the bottom view photo of compatible vacuums on the left, so you get the correct filter. Infinuvo Replacement Side Brush for Hovo 510 Series and Compatible Robotic Vacuums, 3 pack - Infinuvo premium HEPA filter traps more dust and allergens than standard filter. When filter is clogged or damaged, the vacuum will loose suction and pick up less dust and debris from the floor. Replace the filter every 3 months to keep your vacuum at peak performance! Side brush provides better cleaning coverage along edges and around corners, so the vacuum picks up more dust, dirt and debris from your floor. Side brush provides better coverage at corners & along edges, so vacuum picks up more dirt, dust and debris from your floor. Infinuvo Hovo 510 Replacement Filter, 3 Pack, White. Infinuvo Hovo 510 Brush Set - Also works with other compatible robot vacuum cleaners. Infinuvo side brush for Hovo 510 and bObi robot vacuum models. You can buy other bobi spare parts, please search for "Parts Accessories Hovo 510 bObi Robot Vacuum. ". 1 soft bristle brush and 1 beater brush are included. Infinuvo replacement brush set for Hovo 510 and Hovo 510 Plus robot vacuum cleaner. Replace the filter every 3 months to keep your vacuum at peak performance! Infinuvo replacement soft brushes for Hovo 510 series. Compatible models: hovo 510 by infinuvo, Bobi Pet, Bobi Classic by Bobsweep, Hoover Quest 1000. Not compatible models: Bobsweep Standard, Bobsweep Pethair. Side brush provides better coverage at corners & along edges, so vacuum picks up more dirt, dust and debris from your floor. Infinuvo Replacement Brush Set for Hovo 510 Series and Compatible Robotic Vacuums - Replace side brush regularly to keep the vacuum at peak performance. If you need screw, please buy it from ASIN: B07JG1D19R. Including 3 replacement side brushes as a set. Also fit bObi robot vacuums. Replace brushes regularly to keep your Hovo 510 and Hovo 510 plus at peak performance. Before placing the order, make sure to check the bottom view photo of compatible vacuums on the left, so you get the correct filter. Bobsweep 726670294609 - Infinuvo side brush for Hovo 510 and bObi robot vacuum models. If you need screw, please buy it from ASIN: B07JG1D19R. Schedule up to 7 days of cleaning per week, and Bob will automatically start looking for his charging station when low on battery. You can attach a microfiber mop to give your floors that extra polish.
. Also fit bObi robot vacuums. Replace brushes regularly to keep your Hovo 510 and Hovo 510 plus at peak performance. Cats and dogs can live together happily when Bob is around. Compatible models: hovo 510 by infinuvo, Bobi Pet, Bobi Classic by Bobsweep, Hoover Quest 1000. Not compatible models: Bobsweep Standard, Bobsweep Pethair. bObsweep PetHair Robotic Vacuum Cleaner and Mop, Rouge - This robot vacuum features a turboLift™ suction and 1100 mL dustbin - perfect for scooping up pet hair and fur. Works on hardwood, tile, and carpet. Programmable 7-day cleaning schedule. 1 bristle brush and 1 beater brush are included. Also works with other compatible robot vacuum cleaners. Sweeps, mops, vacuums, and filtrates. 1100 ml dustbin holds pet hair and dirt. Colgate-Palmolive Company - Automatic self-charging. Before placing the order, make sure to check the bottom view photo of compatible vacuums on the left, so you get the correct filter. Infinuvo premium HEPA filter traps more dust and allergens than standard filter. When filter is clogged or damaged, the vacuum will loose suction and pick up less dust and debris from the floor. Programmable 7-day cleaning schedule. You can buy other bobi spare parts, please search for "Parts Accessories Hovo 510 bObi Robot Vacuum. ". Including 3 replacement side brushes as a set. And its clean, masculine scent makes using Skin Bracer a great way to face the day. Afta after shave skin Conditioner is specially formulated to soothe and relieve skin irritated by shaving. Afta After Shave Skin Conditioner Original 3 oz Pack of 6 - Get a refreshing start on the day with Skin Bracer in the morning. Skin bracer cools your skin and tightens pores so your face feels and looks healthy. Relieves dryness and replaces natural oils. Works for hovo 510 series and other compatible robotic vacuums. Side brush provides better coverage at corners & along edges, so vacuum picks up more dirt, dust and debris from your floor. Replace side brush regularly to keep the vacuum at peak performance. Nature's Wellness - Common cassia cinnamon tastes harsher and also contains coumarin, which may be toxic in large amounts. If you need screw, please buy it from ASIN: B07JG1D19R. Genuine "true cinnamon" sourced direct from Ceylon and made in the USA, Made with Organic Cinnamon, Veggie capsules. Your heart will thank you for trusting Nature's Wellness! Works for hovo 510 series and other compatible robotic vacuums. Guards against drying effects of sun, wind and weather. Ceylon cinnamon promotes weight loss by helping your body naturally metabolize sugars and fats, reduces blood sugar spikes that cause cravings and chronic overeating. 2 capsules per day is all you need to enjoy the health and longevity benefits of genuine, pure cinnamon from Ceylon: one bottle contains a full month's supply. Organic Ceylon Cinnamon by Natures Wellness | 1200 mg Powerful Antioxidant | Promotes Heart Health | Balances Blood Sugar Levels | Maintains Joint Health and Mobility | Non-GMO | 60 Veg Capsules - Don't buy cinnamon from the store or use inferior cinnamon supplements. Of agriculture, list natural cinnamon among the most potent sources of crucial antioxidant nutrients of any food. Cinnamon is linked with numerous health and longevity benefits, most cinnamon supplements only offer 500mg or less per capsule, including:supports optimal heart and circulatory healthHelps maintain healthy blood glucose levels and blood sugar metabolismSupports joint health and relief from joint painPromotes easier and faster weight lossOur Ceylon Cinnamon Capsules made with organic cinnamon are contained in easy-to-swallow veggie capsules, but you can also break them open to sprinkle on toast, oatmeal, fruits and veggies: the flavor is subtle and more delicious than processed commercial cinnamon you buy at the store!Nature's Wellness Quality Guarantee Check before you buy, cereal, these provide a mega-dose of 600mg per veggie capsule. Compatible models: hovo 510 by infinuvo, Bobi Classic by Bobsweep, Bobi Pet, Hoover Quest 1000. Not compatible models: Bobsweep Standard, Bobsweep Pethair. Turmeric Curcumin with Bioperine 1500mg. Highest Potency Available. Premium Pain Relief & Joint Support with 95% Standardized Curcuminoids. Non-GMO, Gluten Free Turmeric Capsules with Black Pepper.